When the Canadian Patrol Frigate program was conceived in the 1970s and tendered in 1983, some had high hopes for its export potential. While several of the technologies and innovations introduced on the 12 Halifax-class ships eventually found international customers, the vessels themselves never did. However, as the frigates undergo a $4.3 billion mid-life extension and the modernization of their combat, radar and communications systems as well as their missiles, they are attracting attention from a global community of navies with similar sized MEKO frigates all facing issues with aging legacy systems. In late November, the Royal Canadian Navy announced that the first four frigates – Halifax, Fredericton, Calgary and Winnipeg – had all completed their upgrades and that Fredericton was preparing to deploy in early 2015. Furthermore, the remaining eight ships were on schedule to be completed by 2018. The complexity and early success of the Halifax-class Modernization (HCM) program has not gone unnoticed. Case in point: New Zealand. As the owner of two MEKO 200 frigates – part of a 10-ship build known as the ANZAC-class with the Royal Australian Navy in the late 1990s – the country needed options to extend the operational life of the Te Mana and Te Kaha until their planned retirement around 2030. On 1 May 2014, following an international tender, the New Zealand Ministry of Defence awarded a contract to Lockheed Martin Canada under a NZ$446M program for the mid-life upgrade of their frigates, beating out proposals from Thales, Saab, BAE Systems and Selex ES. Although the contract only involved integration of the combat systems, New Zealand had over the previous three years become very familiar with the work being done for the entire Halifax-class upgrade. Once negotiations began, said Don McClure, Lockheed Martin Canada’s vice president of business development, the government quickly expressed interest in having the systems and sensors installed and integrated at Seaspan Shipyards in Victoria, similar to the program of work currently being performed on five of Canada’s frigates. Malcolm Barker, vice president and general manager of Victoria Shipyards, believes two factors were critical to that decision: the strength and experience of the integrated team already involved in HCM; and the opportunity to see firsthand what the full scope of work would look like. He pointed to different configurations for cabling and the mast as two examples that will require a change in approach. “We have production people in New Zealand working aboard those ships with the New Zealanders so we clearly understand the product we are getting,” he added, noting that the 15-plus hour flight between Victoria and Auckland remains one of the more challenging aspects of the project. While New Zealand has contracted separately for certain components of the upgrade and will deploy the Sea Ceptor missile defence system, McClure says the ANZAC frigates will share many of the same systems as their Canadian counterparts. In total, the combat system could involve some 20-30 Canadian suppliers, he said. Most of the hard lessons about systems integration, however, will have been learned on the Halifax ships. “The interface with a particular radar, with an AW system or an IFF (identification, friend or foe) system, even though we are in a world of open architecture, there is a significant amount of work making the software in the command management system work with those particular subsystems, sensors or weapons. On the shipyard side, there are over 60 kilometres of every type of wire and cable, and the process to install and hook up all those systems is quite complex. The teamwork that is required gets better with each ship you do, and if all goes according to plan, it will be right on the tail of the last Halifax-class ship and you’ll have the trained people and processes right there ready to go,” McClure said. 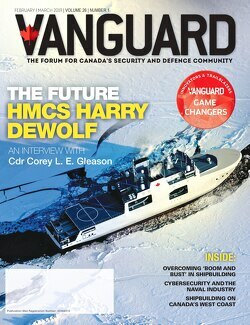 Shipbuilding and submarines may face harsh media criticism in Canada, but both McClure and Barker note that success with the HCM project, the Victoria-class in-service support contract and progress with the National Shipbuilding Procurement Strategy point to an advanced capability with complex projects. Factors such as export restrictions, national shipbuilding capability and defence budgets will limit the number of potential customers, but McClure says they are working with “a list of 10 target countries” likely to proceed with a mid-life upgrade through an international competitive tender. The Canadian Patrol Frigate may not have found any buyers when it was first launched almost two decades ago, but the modernized version now departing shipyards in Victoria and Halifax is drawing increased international attention to the systems integration and production capabilities of Canadian industry.